Dr Gibbons said, “Government welcomes the Opposition’s verbal support for the America’s Cup in the wake of threatening comments from the leader of the Bermuda Industrial Union. “It’s reassuring that the Opposition recognizes that threats, or attempts, to disrupt the America’s Cup events would severely undermine the international credibility and economic future of Bermuda – particularly opportunities for younger Bermudians and small businesses. “The loss of tourism revenues and foreign investment spending coming from the America’s Cup would be devastating for all of us and the reputational damage would be irreparable. “We can assure the community and the Opposition that the Government is working tirelessly to make sure that the benefits resulting from the America’s Cup are inclusive, far reaching and diverse. “However, I must take issue with the Opposition’s statement that the Government has “committed in excess of $100 million of taxpayer funds” to support the event. “This is an unfounded figure with no connection to reality. It is a form of post-truth politics that can only hurt and hinder Bermudian progress. 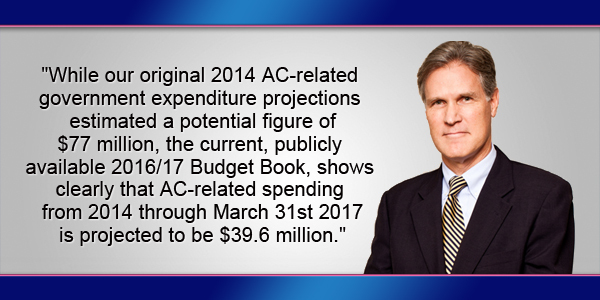 “While our original 2014 AC-related government expenditure projections estimated a potential figure of $77 million, the current, publicly available 2016/17 Budget Book, shows clearly that AC-related spending from 2014 through March 31st 2017 is projected to be $39.6 million – including both capital and operational spending. “The bulk of this $39.6 million spending – $23.7mm – is on capital infrastructure, including preparation of the South Basin dock and Dockyard facilities which will benefit present and future generations of Bermudians. “This amount represents the bulk of the capital infrastructure spending by the ACBDA required under the agreement with the ACEA. “The remaining portion, $15.9 million of this $39.6 million, is current account, or operational spending, beginning in 2014 and projected through March 31st. “This includes $10mm of the $15mm in sponsorship payments to ACEA – money which must be spent in Bermuda under our agreement and is not merely a payment that leaves Bermuda with no residual value to the island. “Next fiscal year’s 2017/18 budget for AC-related expenditure, that will be debated in March, has not yet been finalized, but suffice it to say that the great majority of Government’s direct investment in AC-related capital infrastructure has already taken place. “And it’s fair to say that the further operational spending will be prudent and disciplined. We are being very careful to spend wisely and on things that create legacy value. “At best, the Opposition’s $100 million guess is grossly exaggerated, and at worst simply spreads misinformation. “The America’s Cup presents Bermuda with a one-of-a-kind opportunity to show the world who we are and what we can do. We will be stepping on to the global stage and we all need to play our part, welcoming the world to an Island that works. “The America’s Cup promises maximum benefits to the Island, not just this year, but far beyond. “Bermudians who’ve worked on the America’s Cup projects, or who’ve rented homes to the families of participants, or who are doing business with the event already understand what I mean. Update 5.22pm: Shadow Tourism Minister Jamahl Simmons said, “The OBA Government is on record committing $77 Million to the America’s Cup. Additionally, the Government has guaranteed WEDCO’s $39 Million loan to construct the America’s Cup Base. “The Minister has stated that the budget for next year has not been finalized and we look forward to hearing the details of how much will be spent and how the $39M loan will be financed. “Most importantly, we are very interested in hearing the details and specifics of how the OBA is ensuring that the benefits from the America’s Cup will be inclusive and diverse as far too many Bermudians perceive otherwise. “We stand by our statement, however, it is regrettable that the Minister chose to engage in divisive rhetoric and name calling when he simply could have picked up the phone and spoken to me about his concerns.